A gnat  is any tiny fly in the suborder Nematocera. "Gnat" is a loose descriptive category rather than a technical term. They can be both biting and non-biting. 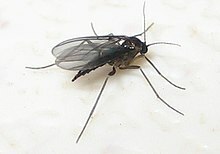 The biting ones are often called midges. Often they fly in large numbers, called clouds, in damp places like the Scottish Highlands. One interesting group are the eye-gnats. the Smithsonian Institution describes them as “non-biting flies, no bigger than a few grains of salt, ... attracted to fluids secreted by your eyes”. 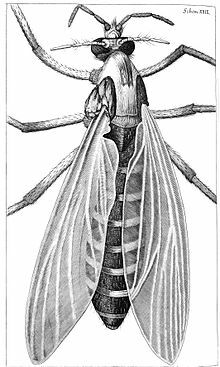 ↑ "Midges and Gnats | Entomology". entomology.ca.uky.edu. Retrieved 2016-09-22. ↑ Gibbons, John. "Gnats always keep an eye out for a good place to eat". Smithsonian Institution. Retrieved 2018-01-21. This page was last changed on 9 July 2018, at 06:24.